Imagine a future where the drugs we rely on to cure common yet life-threatening infections don't work on most people. Now imagine a right-wing regime that only gives the medicine that still works to "productive" citizens. That's right: Millions of people would be screwed. Widespread antibiotic resistance is the looming medical apocalypse most people are too scared to think about. It's simple science: As antibiotics get used more and more, the germs they treat will mutate to become increasingly immune to them. 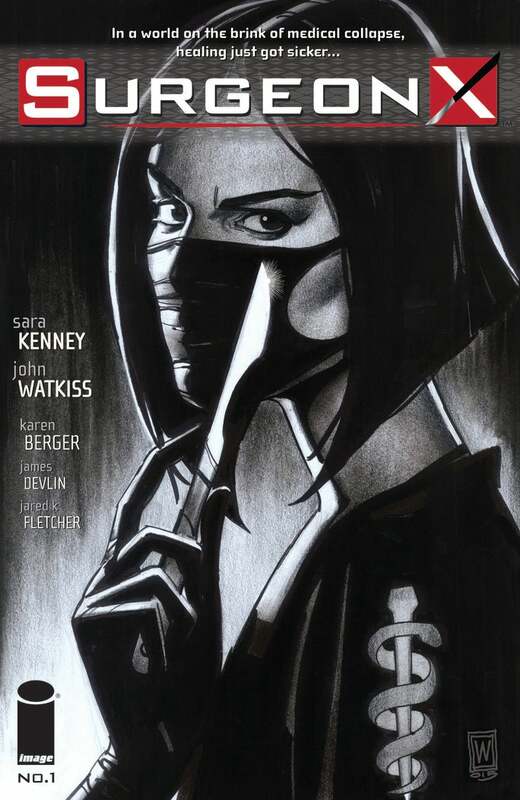 Written and created by scientist/filmmaker Sara Kenney, drawn by John Watkiss and edited by Karen Berger, the influential founding editor of DC's Vertigo imprint, Surgeon X happens in a near-future where that nightmare comes to pass. 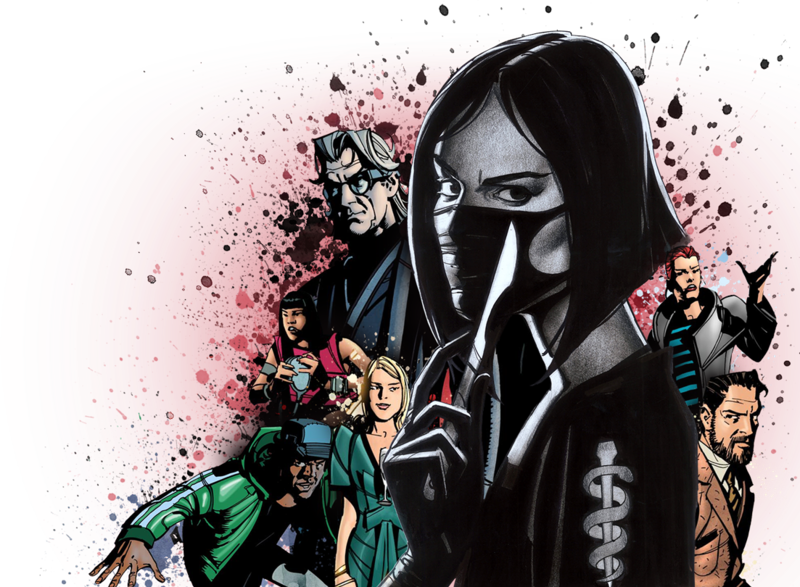 Main character Rosa Scott goes off the grid to set up a speakeasy surgical practice and use untested experimental drugs to try to save lives. 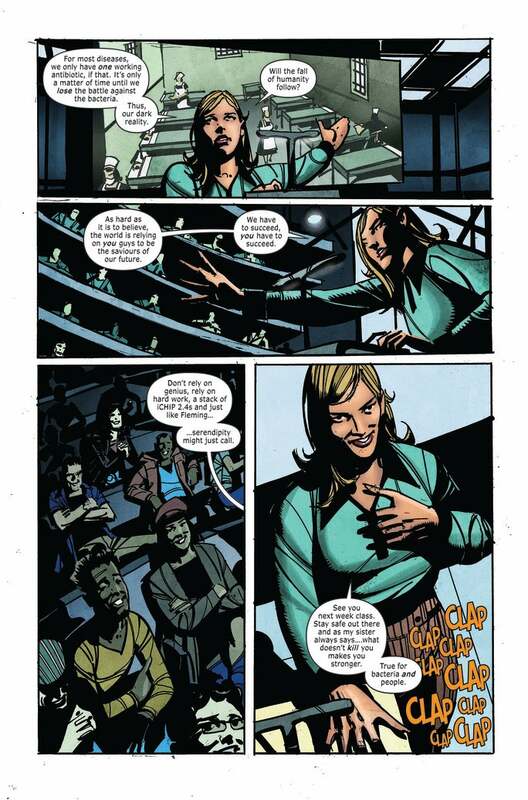 In the exclusive preview below, Sara takes in a lecture by her twin sister that details the history of antibiotics. 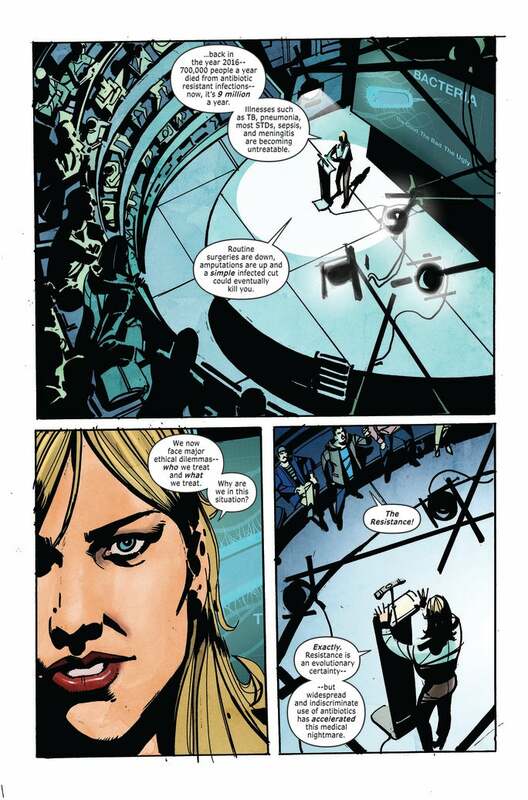 You can get a glimpse of just how hopeless the series' world-to-come looks, which gets rendered in more darkly satirical detail in Surgeon X #1, out on September 28 from Image Comics. EDIT: This daughter of a "left wing" senator hiked the price by 400% (PS: that's real life not a comic). Ring wing, Left wing, both parts of the same Turkey bird. In the scenario described above, the world would carry on. A quick Google search brings up sites that estimate the annual global death rate as being about 55 million per year. An increase of 8.3 million isn't going to cause civilisation to collapse. The reality is that people are denied life saving medicines and pricedures today, either because of where they live or because they can't afford it. I also don't get why in this comic it's the government determining who gets treatment, instead of companies just raising prices on medicines until the expense puts them beyond the reach of most people. 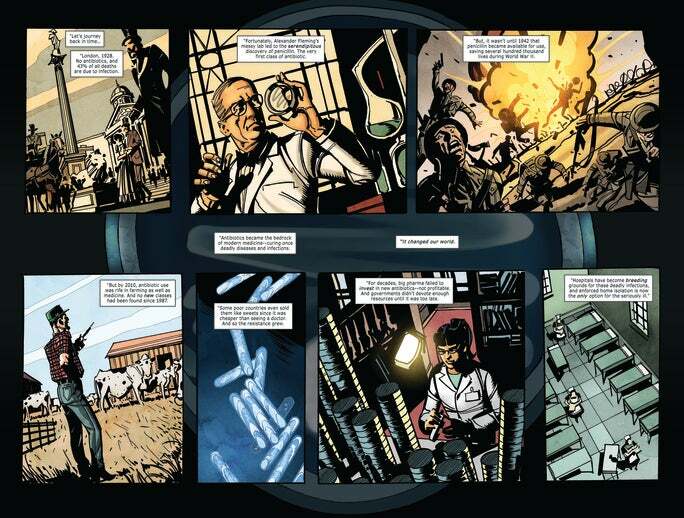 I predict the comic storyline will go the easy route of having the bacterial resistance be the result of some evil conspiracy, instead of an unavoidable natural catastrophe. Yes dear, 'Right Wing'. That would be Authoritarianism, a Right Wing ideology. You know, like Stalinist Russia. Which I bet 50 bucks you claim is 'Left Wing', since like most conservatives you don't know your Das Kapital from a gulag portaloo. It's a pretty easy test. If it's about making the world a better place for everyone through equitable and sustainable practices, it's Left Wing, Progressive. If it's about making the world a better place for a group who already have it pretty good through backwards, fear-driven practices, it's Right Wing, Conservative. Which is why there are actually very few genuine Progressive movements that pass beyond the ideology stage. This is due to the fact that the majority of humans are actually conservative - lazily wired to react primarily in the short term based on heightened fear responses. Which was great for keeping the species alive back in the Ice Age, but is responsible for making life miserable for most of humanity the rest of the time and will probably end the species prematurely. You know it's left wing when they try to re-write history of their constant failures and shift blame to "conservatives". So much projection, prejudice and lazy attempt at deflection. A good laugh for a Monday morning though. So that's 'No, I have a poor grasp of politics and history' then? The definitions are simple enough that even people like you should understand them. You probably think the Labor Party is Left Wing, amirite? No it's fine Burnside. As always I had a good laugh at your hyperbolic over-exaggerated revisionist view. Long live regressives like you, it's ever so entertaining. I mean seriously, way to announce you get your learnins from MRA websites and alt right chain emails. Other than the fact you never actually refute anything with substance because your analytical capacity starts and ends at cut and paste. Hahaha it's always the pesky "MRA's" isn't it. Your phantom boogeymen. You have to put something forward other than gibbering rubbish to refute first. Keep projecting your hatreds and unsubstantiated slurs, I enjoy the show. Have a star. I bet you think the Nazis are left wing too. I mean, they do have Socialist in their name right? Oh we are already at Godwins.... How very predictable from the "progressives". Just preempting the inevitable "the Nazis were socialists too!" Godwin's break from the right. Figured I'd just get it out of the way. No you're just projecting your prejudices early. Good you got it out of the way though. Right Wing or Left Wing, this shouldn't be a political issue. What does either side of politics have to do with the over prescription of antibiotics in some countries and the evolution of bacterial resistance?